Here’s the itinerary as of Sunday December 8, 2013. Bold dates are confirmed. Looking for shows in and around Berlin, Germany. Cities such as: Leipzig, Bremen, Hannover, Hamburg, Frankfurt, Bonn>. Please contact Karyn at karyn@karynellis.com to set up a show in your area! House concert and public venues welcome! 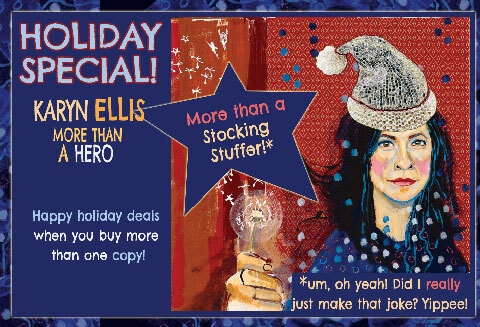 Lovely gift idea ~ pick up copies of my new album, More Than A Hero to share with your friends and family. In perfect time for the holidays! Order now to make sure you get them in time for the holidays!